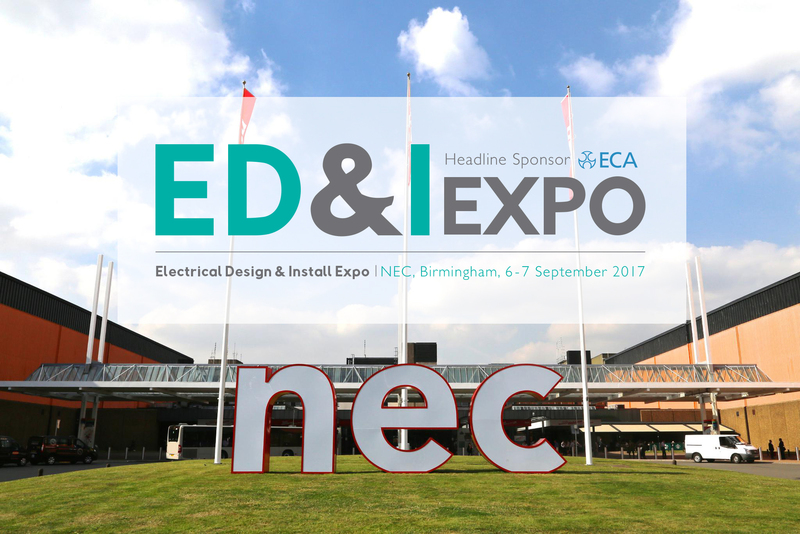 The new national electrical industry trade show, ED&I has announced the line-up of seminars to take place over the two days of the show to be held at the NEC on September 6th-7th, 2017. As well as delivering a show full of innovation, expertise cutting edge products, services and designs, ED&I, with the support of the main sponsors for the show The Electrical Contractors Association (ECA), has now announced an exciting line up of learning experiences delivered by the event. The show has gathered together some top-class talent to provide important learning experiences for ED&I visitors. Visitors will be able to attend sessions covering every aspect of the industry from legislation, to best practice to the changing face of technology. The full list of presentations are below, visitors can register to attend as many sessions as they like, completely FREE of charge! Just another great reason to attend this new national event. ED&I has gained support from some of the biggest names in the business with the Scolmore Group acting as Platinum Sponsors and Schneider Electric and Hotcost acting as Gold Sponsors. The show is also supported by all the major industry associations including SELECT, The LIA, JIB, NICEIC/ELECSA, CIBSE, JTL, BEAME and The Electrical Industries Charity. This session will take a practical look at how to deal with risk assessment in exceptional and other challenging situations. The session will be delivered by Paul Reeve, ECA director of business services. During this session, the ECA’s Gary Parker will highlight some of the recent #RogueInstalls he has encountered, explore common electrical defects, highlight what the law says regarding periodic inspections and makes sense of electrical condition reporting. Gary will dispel myths and give practical relevant knowledge for both clients and contractors within the residential, private rented and commercial spheres. Chaired by the ECA’s Steve Martin, head of technical. With the Wiring Regulations 18th edition close to being finalised and due to be published next year, visitors can join this topical industry debate, chaired by the ECA. The expert panellists will discuss the proposed changes to the regulations and the opportunities and challenges they present to all businesses. Experts from the Custom Electronics Design and Installation Association, trade body for the smart home industry explain how to create the infrastructure needed to deliver 21st century homes. Presented by UK supplier of KNX devices Ivory Egg, this session explores the now huge amount of smart home devices and solutions in the market. Helping contractors to work out which to offer, this seminar will cover what the difference is between a smart device and a smart home, the different types of intelligent solutions available and how you can get involved in the smart building industry. Technological advances are transforming the way domestic life saving devices are used, from cloud based monitoring systems to intelligent multi-sensor alarm features. Join Aico to understand how this new technology will impact the whole industry. The speaker will be Andrew Speake (IT Manager). With such a fragmented approach to energy management, Lisa Culshaw presents an overview of how to successfully augment existing energy solutions to deliver a truly holistic view of an entire estate and the associated benefits it delivers. The emergency lighting standard BS 5266-1 previously concentrated on getting people out of a building in the event of power failure. Recent changes mean that you must also consider those who wish to remain in the building. As a result, when designing and installing your next emergency lighting system, there is a need to ensure clients are not left in the dark. This session will enable you to familiarise with the changes and find out best practice. Steve Martin, ECA head of technical, will present this session. This seminar is designed to overview energy usage within commercial and industrial buildings and technologies that can enable energy and asset management information to be collated from standard installations through the use of intelligent or ‘smart’ products. Outlining when CDM 2016 does – and doesn’t – apply and an outline of the duties on construction contractors. Presented by Paul Reeve, ECA director of business services. A complete overview of this important subject. This session will cover the impact of the upcoming PoE standard and its impact on structured cabling design for remotely-powered IP devices. 12.15 – 1.15 – Panel discussion – Keeping On The Right Side Of Health And Safety Law. Chaired by ECA’s Paul Reeve, director of business and external affairs, a diverse range of industry professionals will join the panel. The discussion will cover understanding the basics of health and safety law and industry pre-qualification and what’s needed to avoid prosecution, large fines and HSE fees for intervention. With the expected publication of the new fire detection and fire alarm systems for buildings BS 5839-1 due this year, the ECA’s fire and security specialist Peter Baxter will explore these changes. He will also highlight the relationship between Part 1 and Part 6 systems to help you design the right system for your building. This session reveals how the EU Construction Products Directive has influenced network cable construction and its specification in intelligent building designs. Experts from the Custom Electronics Design and Installation Association, trade body for the smart home industry explains how to create the infrastructure needed to deliver 21st century homes. 4.30 – 5.00 – Growing, Improving And Protecting Your Business. ECA – Headline sponsor presentation, explore the true value of joining your industry trade association. Why becoming an ECA member is more than just a ticket to work.